The jacket is now basted in place and starts to take shape, though it still looks like a mess. The real exercise of this fitting is to try to see all the possible faults and inconsistencies and fix them before we start closing the seams with hand stitches. And believe me, unpicking hand-sewn seams breaks one's heart! 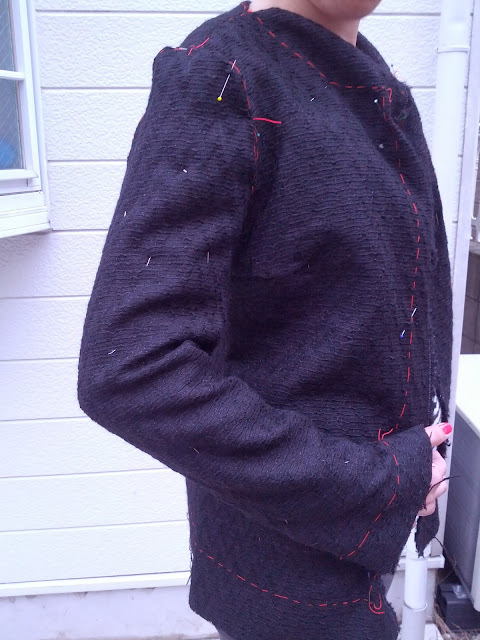 For the fitting, pin or baste one sleeve to the jacket and put it on. When you have your jacket on, it's important to move around a bit: bend your arms, turn right and left, try it with the jacket open or closed. Remember, do not press your basted seams! By pressing them with an iron you settle stitches to the fabric, which we want to avoid at this stage. It is enough to just use the warmth of your hands to press them slightly open. Luckily for me, the time spent on the muslin paid off: my jacket did not require any alterations. But I would like to redirect you to Leisa's blog where she highlights the fitting issues with her daughter's jacket. It's so well documented! Check it out! After spending three and a half years in Japan, I will tremendously miss Tokyo and everything it has to offer. But I will equally miss my APAC blogging friends. It was a great pleasure meeting you and becoming your friend! But, hey, I'll see you very soon! Your jacket is looking great. I'm really enjoying reading the posts in this sewalong. So much useful information. It's brilliant - thanks so much to you both. Safe flying and look forward to hearing you are safe and unpacked in London. Your jacket is looking fabulous. Safe travels and we will hear from you soon once your feet are safely on the ground in London. I lived in London for a couple of years and loved it - I was always hoping to go back but once kids come along life changes completely. Bon voyage Inna et look forward to reading you soon in your new country! You're probably up in the air right now. I wish you a safe landing in London! It will be cool to have you on a closer time-zone...start bookmarking easyjet.com it will come in handy in Europe. I can't believe you actually had time to post this! Moving to another continent so SO stressful; all the best! Love your jacket, it's looking wonderful. Your jacket is looking very good and Leisa's post is very informative. Hope you had a stress free flight and I'm sure you will be welcomed with open arms and the rest of look forward to hearing from you in your new home. I hope the move went well! !